Still recovering from the nightmare of being force-fed stinky and bitter boiled brussels sprouts as a child? 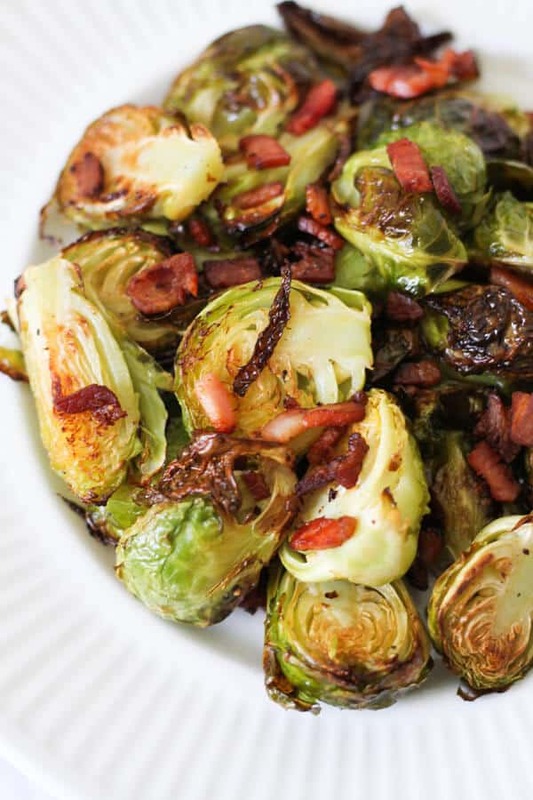 Never fear – these Oven Roasted Brussels Sprouts with Bacon will turn even the most adamant brussels sprouts hater around. Brussels sprouts really shine when roasted – crisp and caramelised on the outside and tender on the inside. Not to mention how simple it is – throw everything on a tray in the oven for 25 minutes and viola! This is a great side dish if you’re trying to feed a crowd following different diets. It’s Low Carb, Whole30 and Paleo friendly and is free from dairy, gluten and sugar. HOW TO SHOP FOR BRUSSELS SPROUTS? Look for bright green heads that are hard when you squeeze them and with leaves that are tightly compacted. Avoid heads that have holes, yellowing leaves, black spots or are shrivelled. Smaller sprouts are sweeter and more tender, while large sprouts are more cabbage like. Pick heads that are a similar size to help them cook evenly. You will find brussels sprouts that are sometimes available on the stalk, particularly if you visit farmers’ markets. There’s little difference between the stalk or loose brussels sprouts – they just keep longer when attached to the stalk. If you intend on cooking them within a few days, just select whatever is available. HOW TO STORE BRUSSELS SPROUTS? 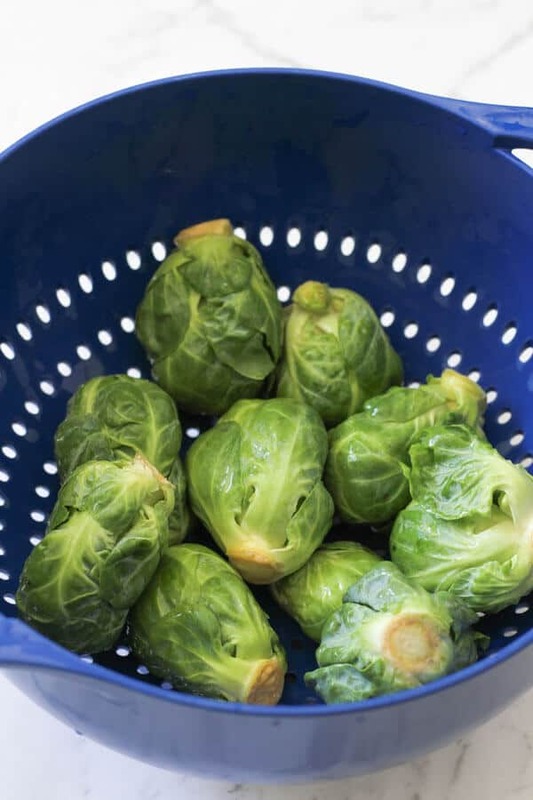 Store brussels sprouts in a plastic bag or container the vegetable crisper. They are best when used within a few days of purchasing, but they should last up to a week, if not more. If you purchased brussels sprouts on the stalk, keep the heads attached until you are ready to use to help the heads stay fresh longer. Store the stalk in fresh water, like flowers, and simply remove the heads when you are ready to use. 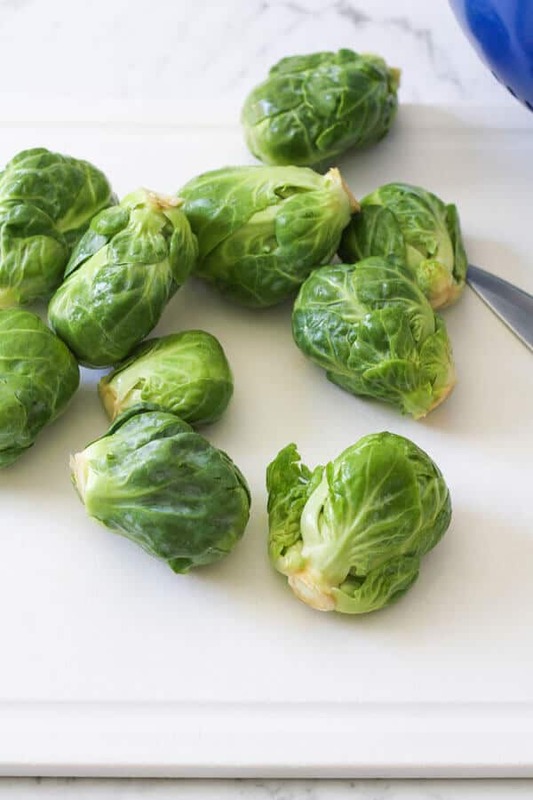 First, rinse and clean your sprouts (as pictured below). Be sure to dry them off either with paper towel or in a salad spinner. This helps ensure they get nice and crispy in the oven. Next, trim the stem from the heads (as pictured below). Peel off and discard any leaves that are yellowed or blemished. 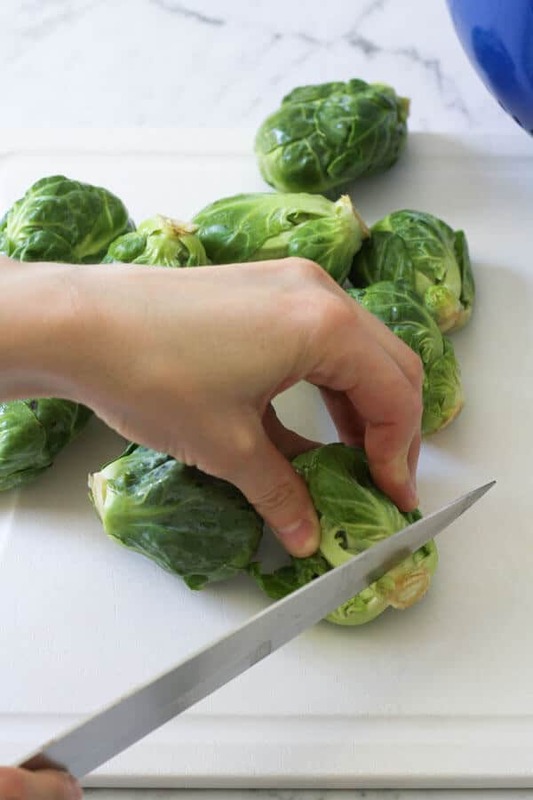 Then chop the sprouts in half lengthways through the stem (as pictured below). Be sure to hold on to any green leaves that fall off in the process – these turn lovely and crisp when roasted. Preheat the oven to 220C / 425F. Place brussels sprouts and bacon on a baking tray, drizzle olive oil on top and season with salt and pepper (as pictured below). Mix well together with your hands, then spread out to ensure the sprouts aren’t overlapping. Roast for 25-30 minutes, turning half way through, until tender on the inside and crisp and charred on the outside. Serve as is or with a balsamic glaze drizzled on top (see below for more details). How to make a balsamic glaze? I popped the balsamic glaze down as optional BUT it does elevate the dish and I find it’s especially impressive when you’re serving this to guests. To make a balsamic glaze, all you need to do is add 2 cups of balsamic vinegar to a saucepan and bring to boil over medium heat. Once it reaches a gentle boil, lower the heat and let it simmer, stirring occasionally until the balsamic vinegar is reduced by about half and the glaze coats the back of a spoon (approx. 20 mins). 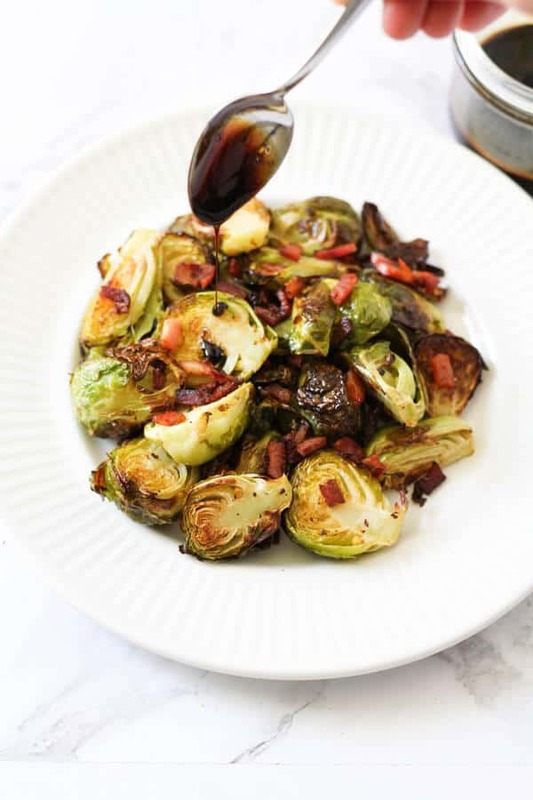 You can then either drizzle the balsamic glaze on top of the brussels sprouts immediately after they come out of the oven OR pop your glaze in a serving bottle and let your guests pour it on themselves. If you have any glaze leftover, store in an airtight jar in the fridge for 2 weeks. Buy sprouts that are small, firm and green. Cook them within a few days after buying – they are sweeter this way. 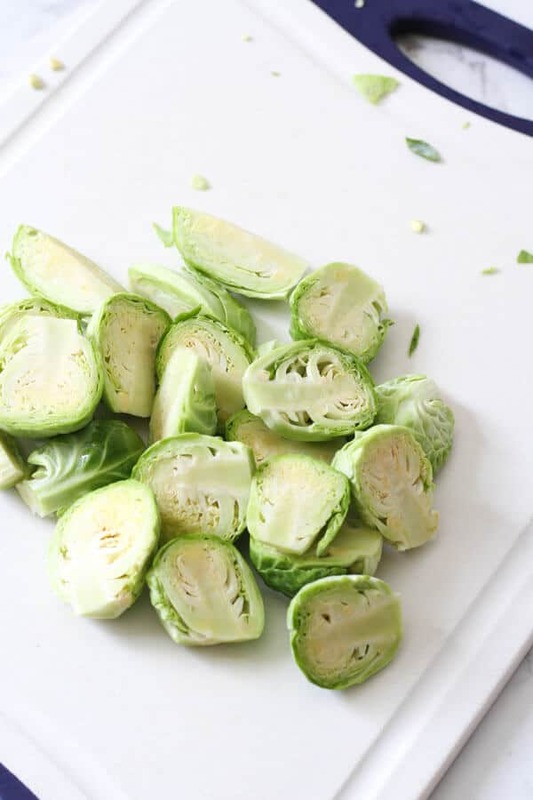 Dry your brussels sprouts thoroughly before roasting to make them crispier. Trim the stem off the brussels sprouts and halve before roasting. 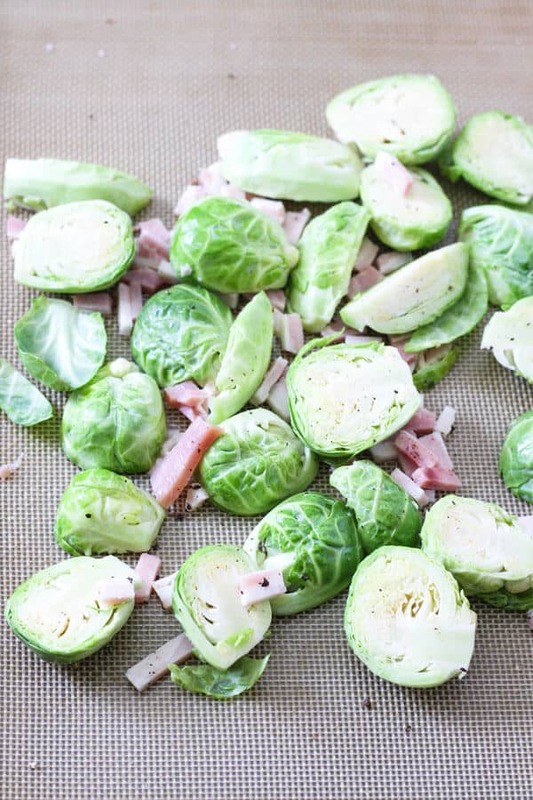 Don’t overlap the brussels sprouts – this causes them to steam rather than roast. 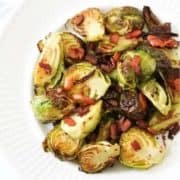 If you’ve tried these Roasted Brussels Sprouts with Bacon I’d love to hear how you enjoyed them! Pop a comment and a star rating below! You can also FOLLOW ME on FACEBOOK, INSTAGRAM and PINTEREST to keep up to date with more delicious recipes. 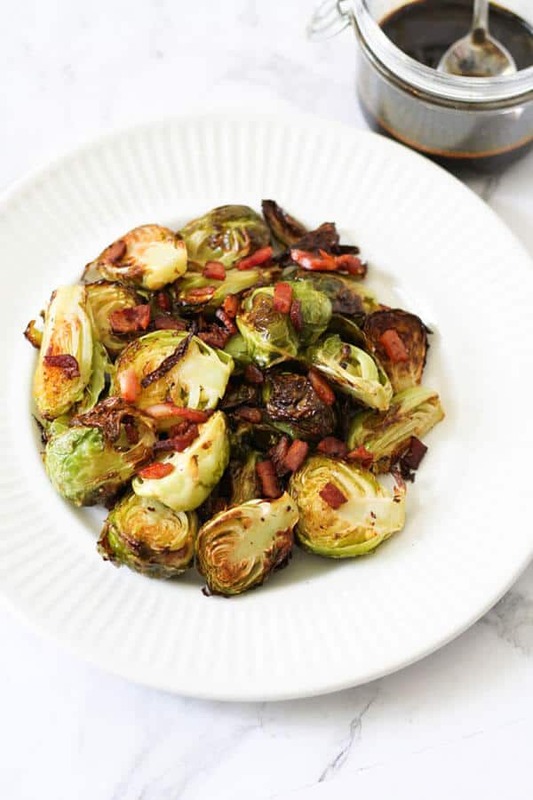 Roasted Brussels Sprouts with Bacon that are so easy to prepare, with just 5 ingredients and one-pan. These sprouts are crispy on the outside and tender on the inside. 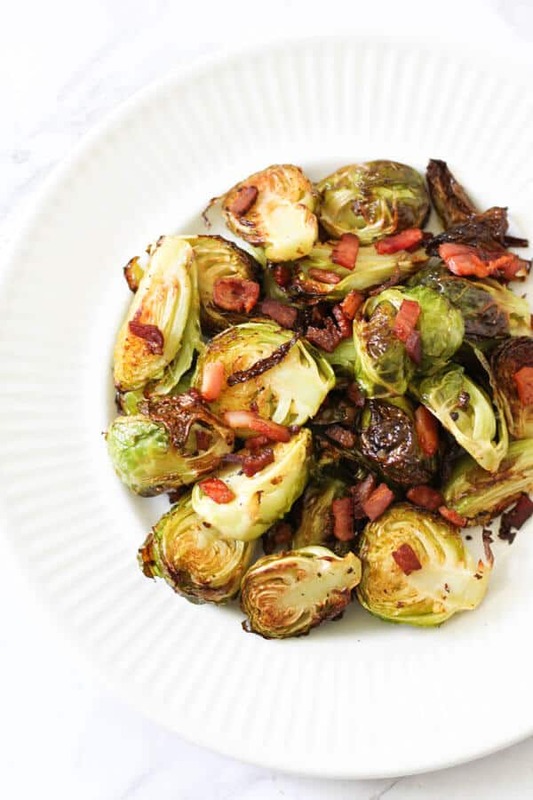 Place brussels sprouts and bacon on a baking tray, drizzle olive oil on top and season with salt and pepper. 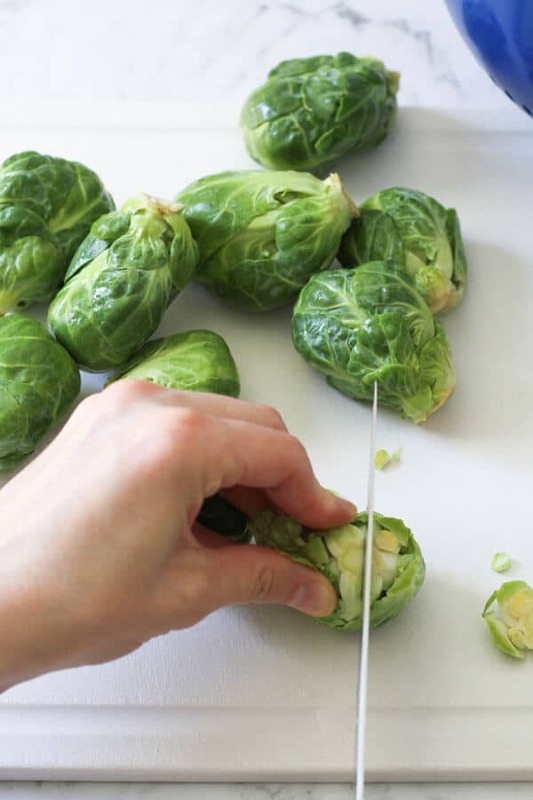 Mix well together with your hands, then spread out to ensure the sprouts aren't overlapping. Roast for 25-30 minutes, turning half way, until tender on the inside and crisp and charred on the outside. Serve as is or with balsamic glaze drizzled on top. Cook them within a few days after buying - they are sweeter this way. Don't overlap the brussels sprouts - this causes them to steam rather than roast. Nutrition information provided by a nutrition calculator and is based on one serve. YUM. I had some Brussels sprouts in the fridge so made this up for dinner tonight including the balsamic glaze (how easy is that??? ).